It’s Bosma’s mission to provide employment for people who are blind or visually impaired. 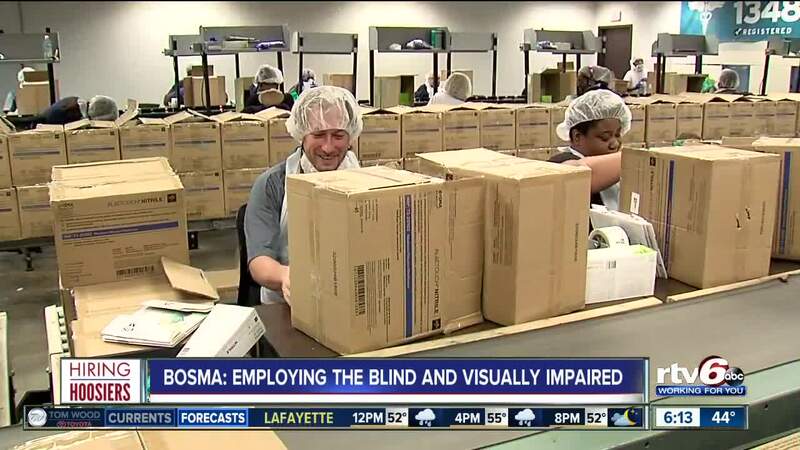 INDIANAPOLIS — In Indiana, there’s a 63 percent unemployment rate for people who are blind or visually impaired, but at Bosma Enterprises, more than 50 percent of its workforce is blind or visually impaired. "This is where we package gloves, we get them, they go behind us, they load up on our lines here, and then we re-package them," Scott Mullendore, a production employee said of a typical day on the job. Mullendore said he’s grateful to be at Bosma for a number of reasons, the first being the fact he has a job at all. “Phone interviews would go great, walking in… that was a problem," Mullendore said. "As soon as you head through the door with a cane, they’re like, 'Um, we’re sorry but we don’t need you.' So yes, that’s happened a few times." You wouldn’t know it by just looking at him, but Mullendore is visually impaired. So are all his co-workers. Jeffrey Mittman, chief operating officer at Bosma, said one of the greatest misconceptions about the blind and visually impaired is they don’t have the skills for employment. In 2018, Bosma helped approximately 800 Hoosiers adjust to vision loss, much of which was workforce training. "What we do is we do a lot of work for federal, state, and local government, and with commercial partners," Mittman said. We do a lot of packaging, a lot of kitting opportunities, a lot of warehouse and distribution, and we use blind individuals here to do that." Bosma placed people in 30 different companies around Indianapolis just last year. "Once we get one in there, they’ll come back and ask for a second, third, fourth individual because they see the benefit of having those people," Mittman said. Bosma has the talent, they’re just hoping others will recognize it too. "We’re willing to work. We can work," Mullendore said. "We know how to work. We just need the opportunity to work." Mittman says one major barrier for Bosma employees and the blind and visually impaired in general is transportation. Bosma provides, and works hard to find rides for anyone who may need one, but they say that can be a challenge when people with vision loss are looking to work elsewhere. Bosma currently has a number of job openings, and they offer competitive wages, insurance, paid holidays, and retirement benefits.